45 Million Candlepower Handheld Spotlight - 10" Lens - 80 Watt HID - 7200 Lumens - Spot / Flood(-21' Ring Terms). Buy American Compliant When your number one priority is simply getting as much light as possible to an area, HID lights can`t be beat. The HL-85-HID-80W-CPR super bright handheld spotlight boasts an intense 7,200 lumen output and a tightly focused beam that reaches over 7,000 feet. Rustproof, shockproof, and IP65 rated waterproof, the HL-85-HID-80W-CPR is ideal for hunting, hiking, camping, security and military applications as well as for boating and marine use. 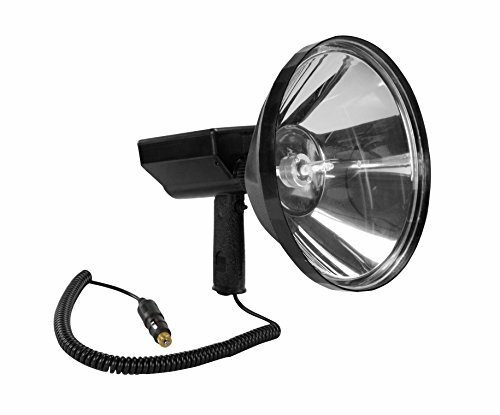 Larson Electronics offers this light in a 10" reflector size. This light operates on 12 or 24 volts DC and includes a 16 foot coil cord with cigarette plug for connection to vehicles, boats ATV`s and similar vehicles. Combining a powerful 80W HID bulb and a specialized reflector and lens placement, the HL-85-HID-80W-CPR handheld spotlight penetrates the darkness with 7,200 lumens of super bright light and a beam length of over 7,000 feet. The adjustable lens is offered in a 10" lens and is adjustable from spot to flood to provide flexibility in the field without having to carry multiple products. The unique shape and shallow contour of the reflector is paired with a convex lens and inset lens position to efficiently capture and project a focused beam of light while reducing the light spillage and waste that is common with many spotlights. This efficient design also reduces casting, a phenomenon that occurs when wasted light "spills" around the light source. Often times, when surrounded by water, snow or other reflective surfaces, this light spillage prevents the human eye from adjusting properly and seeing objects at distance. With the HL-85-HID-80W-CPR spotlight configuration, 90% of the emitted light is captured and focused, clearly and sharply illuminating objects all the way to the end of the beam reach. Constructed with a high impact nylon handle and lamp housing and thick polycarbonate lens. Light operates with 12 or 24 VDC and draws only 9.8 amps at start and 6.7 amps continuous.